.....the poor man's Ann Arbor. As the proud owner of a rebuilt '64 Princeton 6G2 BFWK, (Blackface White Knob) I invite all 6G2 & 6G3 owners and aficionados to post their stories, pictures and thoughts on what many consider to be the finest sounding tube amps, with the most awesome tremolo, that Fender ever built. p.s. Send me your pics and I'll post them @ The 6G2 & 6G3 Club Photo Gallery. 6V6man- nice job on the rebuild! I bet it's pretty gratifying to bring an amp like this back to life. I bought my 6G2 fairly recently and it the sound totally threw me for a loop (in a good way) after having owned a number of SF amps. It quickly became my favorite Fender amp for its dark smooth creamy tones and awesome OD when pushed. THese amps are a well kept secret and I'm amazed the aren't more sought after. Anyway a losted a link to my '63 Princeton which is in close to mint condition. It has a couple a scratches on the faceplate but that's about it for wear. The original CTS speaker has been reconed but I put a Weber 10F125 in it which both brightens the amp up a little and holds together when I pushe it for OD. WOW! Have you got a time machine? Mint? It looks like it just got built yesterday! Great find Rocky_Strat! Yes, it is very satisfying to have saved an old amp. When I bought it I really didn't know just how great these amps were. It's a keeper! I picked up my '62 Princeton just a while back. Minty mint 'cept for some grille cloth age stains. Sweet sounding amps for sure! I have a 62 by the trannys, the chart is messed. It is farty and the bass sound like cardboard. I invision great things for it. Very sweet lookin' too, SunnBird! Ive got two 6G2's to share but could someone tell me how to post the picture? I am about to recap one of the blackface w/white/cream knobs. IM gonna do a new can cap and all across the board.25ufx25v . I will do before and after pics. The can cap only has two of the four tabs soldered on. I will solder back only two, just like the stock one. I have a weber 10F25 in it and a stock oxford in the brownie and a old jensen P10R in the other black one. two of mine came with the footswitch., black ones. I just uploaded a pic of my BFWK 6G2. I replaced the original speaker with a Alltone 1025 shortly after getting the amp and I recapped it yesterday just to be on the safe side. it had all the original electrolyics in place. The tones that these amps produce is sublime. Thanks to 6V6man for the volume knob that my amp is now sporting. Nice looking Volume knob! Is it really a bit lighter than the originals, or is that just in the photo? Great looking Princeton! I noticed that the volume was set at about 9 1/2. Where is the sweet spot at? How about everyone posting their favorite settings? The sweet spot on mine is with the Volume at 7 1/2. I like to set the Tone at 5 1/2. Nice amp Omaz, but frankly I think the other two pics in your profile are a MUCH better use of bandwith!!!!!! Thanks lager68. I'll pass that along to my daughter and her friend. I sometimes set the volume at 4, 7 or flat out, depending on my mood. I always run the tone at 10. It doesn't seem to matter which of my guitars I use. They all sound swell thru this amp. I don't have a web publishing program anymore but if you look at Rocky_Strats' picture of his Princeton it is excactly like mine right down to the shade of brown that the grill cloth has turned to.I would swear it was mine. I love this amp,perfect for home use. It is on "10" all of the time.I also plug my electric acoustic into it,the sound is great with volume up to about 4. I have had it for 15 years and never put a dime into it. I got it for $200 canadian.Priceless! The 6G2 Club is off to a great start, keep those cards and letters comin' in folks! 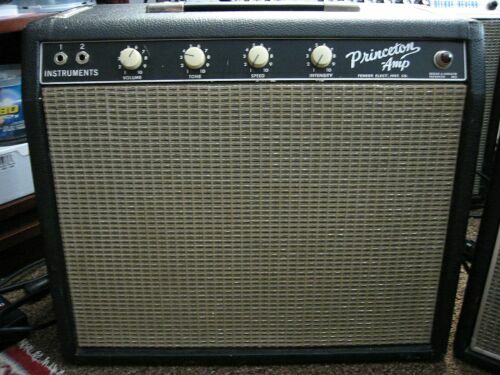 Man, those original black Tolex Princetons are stunning, I might have to redo mine using the authentic Tolex and grille cloth colors. I had a '63 BFWK 6G2 that I bought at a steal and turned around and sold it for enough to get my money back and enough extra to buy the parts for my homemade version, including Mercury Magnetics transformers. the sweetest sounding fender-amp this side of a grand. puts any champ i�ve played to shame! i made a 12" baffle for mine and it rivalled my brown deluxe both in terms of tone and loudness. A little unorthodox, acorkos.....but I'm not one to talk since my 6G2 is not all original anyway. You've captured the 'Spirit Of The 6G2' and that's what really counts here. The 6G2 Club is about inclusion. Welcome to the club! "Tone Isn't Everything, It's The WHOLE Thing!" Hi Carsten! How does your '64 BFWKcompare to your '66 BF in terms of loudness, tone, etc? How 'bout some BFWK pics? Maybe a family portrait with it's brothers, sisters and cousins. I've created a Yahoo photo gallery of the 6G2 pics that have been posted so far. I'll add new photos as they are posted.